Welcome to The Drift where Jalopnik East rounds up the highlights from all around the Pacific Rim. In today’s headlines, Mazda gives its Ranger-by-another-name BT-50 a facelift but not much else, Tesla is posed to push hard into the Korean market, and North Korea adds bike lanes to Pyongyang. 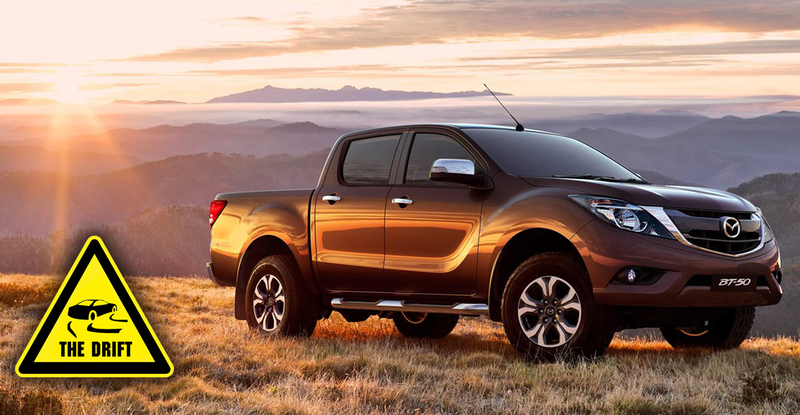 Mazda has just released the first teaser image of the BT-50, cousin of the Ford Ranger, accompanying the announcement that production on the truck has started in Thailand. Like its cousin, as well as competitors like the Toyota Hilux, this is just one more vehicle which ain’t coming to a dealer near you (if you’re an American... or Japanese, for that matter). Instead, Mazda has plans to roll out the new BT-50 to the Thai and Aussie markets at the end of 2015. The new styling incorporates a newly designed front face, rear combination lamps and aluminum wheels. In addition, the interior has also been refined to give a higher-quality feel. For the first time, the model features a rear-view camera as safety equipment to support safe driving with peace of mind. The powertrain and body-type line-up is unchanged from the previous model. So... Basically no change in the vehicle’s actual technology? *Yawn* Of course, I am sure it will sell like hot meat pies in Straya, after all, it’s one of the best “utes” out there, apparently. With the Chinese market tumbling and Korean tastes changing towards imported luxury cars, the Korea Herald is reporting that Tesla has turned its gaze to Korea to shore up East Asian sales. The Herald cites a posting on the Tesla Japanese website, but a cursory glance through the Japanese team blog didn’t find the posting. “Our Japan-Korea sales vice president will be focused on all of Tesla’s direct sales activities in the Japanese and Korean markets, ensuring the attainment of both short- and long-term sales objectives,” the online posting said. If this is an accurate report, now would be a good time for Tesla to get into the game, as luxury car sales are on the rise with the current corporate tax scheme, and lukewarm interest to domestic attempts at meeting luxury demand. If the Korean government ever subsidises or offers further tax incentives for luxury and/or electric vehicles, Tesla could be well placed to take advantage of an early entrance into the market. In an attempt to limit the amount of collisions and traffic accidents in the North Korean capital of Pyongyang, the government has begun to build more bicycle lanes, according to Reuters. In a nation where car ownership is so extremely expensive as to only be available to those at the very tip top of the top of North Korean society, even bicycles are expensive. Bicycles are not considered vehicles and not allowed to ride on Pyongyang streets. This has led to riding dangerously on sidewalks and other side areas along the roads. Bike paths are an attempt to create safer bike traffic near roadways. In North Korea, bicycles are largely utilised in a semi-tolerated private market mostly run by women—which has led to the humorous-in-any-other-context idea that “bikes are for women,” and that men should not ride them. This is in addition the the fact that bicycles are perhaps seen as “unsophisticated” given that even living in the North Korean capital means you are in a far better place, hierarchically speaking, than most citizens of the hermit kingdom. Of course, you know, most North Koreans outside of Pyongyang can’t afford food, let alone anything on wheels, two or four. Images via Tesla and Mazda, modifications by Kat Callahan/Jalopnik.